System Restore is a very useful feature; it becomes even more useful if you know the right way to use it. The longer you have to go back in time using System Restore, the less likely the System Restore will be successful. The key to successfully using System Restore to repair your computer is to use it as soon as you can after you notice the problem. Think of System Restore as the doctor and your PC as the patient with a serious illness. The sooner you see Dr. System Restore, the more likely it is he’ll be able to cure your sick PC. So, as soon as you notice your computer not running correctly after an update, after you have changed settings, or after you’ve installed something, think of Dr. System Restore. Many times he can fix your PC if you make an appointment with him right away. 2. Before you do anything else, make sure you’re seeing all your restore points. If the option to “Show more restore points” is not available, then the restore points you see are all you have. In that case you may want to increase the space allotted to System Restore point – see how to do that here. Always select the Restore Point as close to the date when the problem started – but make sure it’s before the problem. The further your have to go back in time the less likely System Restore will be successful. That being said, it’s worth trying System Restore even if you’re using a restore point several weeks old. We’ve seen older restore points work many time. But as a general rule, the more recent the Restore Point the more likely it is that System Restore will be able to repair your system by restoring it back to the way it was before your problems started. Keep in mind that when you do a System Restore, you won’t lose documents, pictures, emails, music, videos, bookmarks or any personal files. You’ll only be missing any programs or updates you installed between the current date and the date of the Restore Point you used. So, your personal files are not affected. If System Restore is unsuccessful in repairing Windows, in Windows 8x you have the options of System Reset & System Refresh. In Windows 10, you have the option of System Reset while keeping your personal files. See our Windows 8x tutorial for System Refresh here; see our tutorial for System Reset for Windows 10 here. 3. System Restore will start loading immediately. When things go awry, think of System Restore first and use it as soon as you notice a problem. The sooner you use it after your problem(s) occur, the more likely it is that System Restore will be able to correct the problem(s). Many thanks for “refreshing” my mind. Sometimes us senior folks forget things like this and need a bit of reminding. I have a digital ant on my laptop screen that “crawled” around for a few hours a couple of days ago and is now dormant at the bottom of my screen. Will system restore remove it? Is it hurting anything? I have no idea what a digital ant is; I’ve never heard of it. When did it start? What have you installed recently? 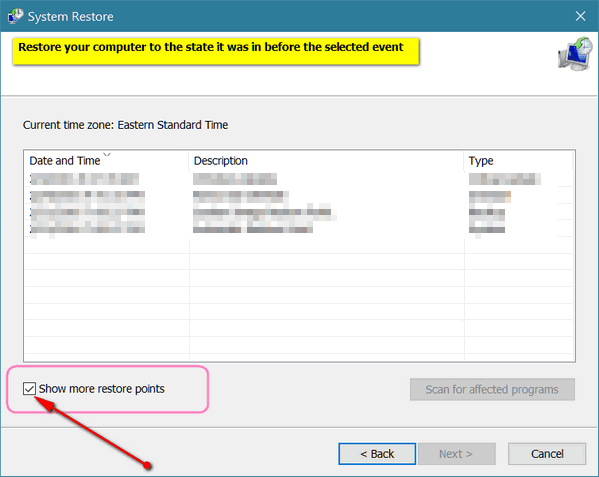 System Restore can remove unwanted software installations as long as you have a restore point date that is before you installed the questionable software. Let me know how long this has been going on.